** Update! 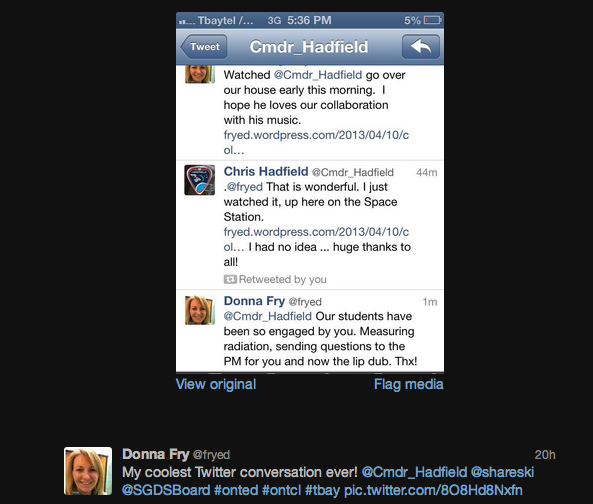 We now know that Chris Hadfield (@Cmdr_Hadfield) watched our video on the ISS! How exciting for our students. Commander Hadfield understands the importance of connections for learning. His song with Ed Robertson is all about how the world is one place, all interconnected, and the video shows how this is so true. Student teachers, learning from classrooms around the globe, sharing and connecting. Chris Hadfield has made powerful connections with students across Canada and his influence is being felt by an entire generation. Thanks Chris! I am so excited tonight to see the finished collaboration my students were recently involved in. After spending some time with our student teacher from the University of Regina, ECMP455 students wanted to connect all of the great classrooms they had been learning in around the world with a lipdub project. I sent the idea out and I was thrilled to see two teachers at our school take it on. They did a fabulous job, and we are excited to share the spotlight with “Daniel and the Atkins”, our Saskatchewan pre-service teacher and his beautiful daughters. A special thanks goes out to Dean Shareski for coordinating the project and including us. Totally utterly awesome! I teach primary science in Australia and am inspired to try something similar. Thank you! Wow, my k students are shocked when they hear the class next door singing this song. Now they will see people across Canada singing it. In our class we r preparing for Music Monday. We will all sing this in the assembly. We hope all of you remember to sing it again on the first Monday in May. Now that’s what I feel “my Canada” is about! I’ve never had so much joy watching so many positive ripple effects that, in this case, one man can have as he puts his heart into it, by himself and from so far away… I’ve never been so inspired. That’s the power that one person has! Can you imagine if we’d harness 2 people like Cmdr. Chis Hadfield? Then 100,000? I want to stop watching the news, which is mostly awful in contrast. I want a Chris Hadfield day instead. Every day. Thank you sir for making such a difference and all the best! My classes and I also enjoyed the experience of working with our preservice teacher, Joz. This was my first foray into online mentoring from thousands of miles away AND my first lip dub. We are the split screen class. Here’s my blog post: http://goo.gl/Woaoc Thanks for posting this! 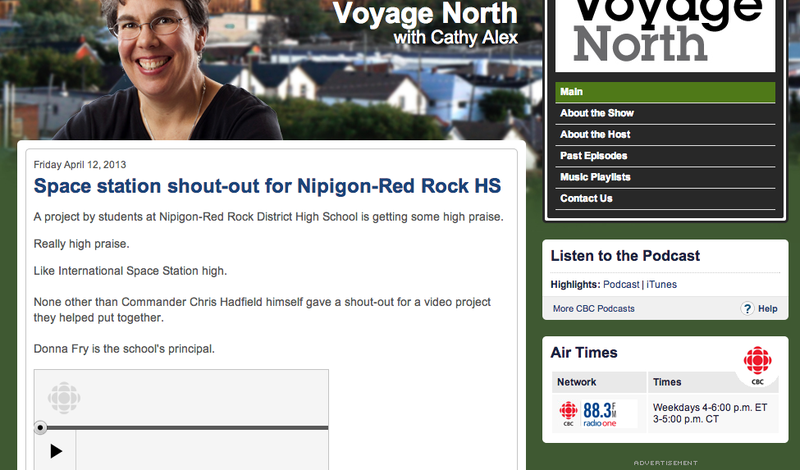 It is exciting to know that Chris Hadfield saw our video– totally out of this world!